Jānis Jaunsudrabiņš (1877–1962) was a famous Latvian author and painter. His life and work were imbued with bright light and clear vision. Having come from the countryside, Jaunsudrabiņš was well familiar with the life on the traditional Latvian farm and its intimate connection to the cycles of nature. As many Latvians he, too, had to experience personally the dramatic shifts and collisions of the 20th century. During World War I, Jaunsudrabiņš shared the fate of many refugees in Northern Caucasus; then he experienced peace and relative prosperity of newly independent Latvia and familiarised himself with Western culture. At the end of World War II, Jaunsudrabiņš was once again a refugee – this time in Germany where he settled in Kerbeck, living there until his death in 1962. In 1997, Jaunsudrabiņš was reburied in Latvia, near his Nereta birthplace. Having studied drawing and painting in Riga and perfected his skills in Munich and Berlin, Jaunsudrabiņš vividly revealed his sincere and benevolent personality in his works, both in visual art and literature. He was particularly loved and acclaimed for his literary work, however, including fiction. Jaunsudrabiņš was also the translator of many foreign classics. Indication that his oeuvre was in the highest esteem was the Three Star Order awarded him already in 1927. During a stay at the writers' retreat Burtnieku Nams on the outskirts of Riga, Jaunsudrabiņš started writing his masterpiece, "The White Book", one of the most outstanding works of Latvian literature. The first part of it was published in 1914 and the second followed in 1921. It is a fictionalised memoir of the writer's childhood seen through the eyes of the protagonist Jancis, and, at the same time, a panorama of the Latvian country life in the mood of the late 19th century and passing of the year with its four seasons' cycle, supplemented with heartfelt illustrations by the author. Despite the realism with which everyday life is depicted, the book has spiritual undertones and its humanist ethic is akin to Latvian folksongs, the dainas. The benevolent attitude towards nature, people and life as such grows on the reader and in later life is remembered with great fondness by many Latvians who read it in their childhood. An attractive ethnographic testimony, yet, looking beneath the surface, we encounter in this book a message on the Latvian spirit, character, mentality, closeness with God and the nature, and toil. Hence "The White Book" is gaining in importance in our globalised and urbanised environment. It can be compared to a cornerstone or an anchor, yet it is also a lighthouse that may help one stay afloat in the stormy global seas. For Latvians, it is a book that is kept not far from the Bible. The deceptively provincial lessons of "The White Book" are at the very heart of the patriotic call once issued by Jaunsudrabiņš in exile: "Remember Latvia!" Guided by this heartfelt motivation, Latvijas Banka has emitted a euro collector coin to commemorate the 100th anniversary of "The White Book" by Jānis Jaunsudrabiņš. 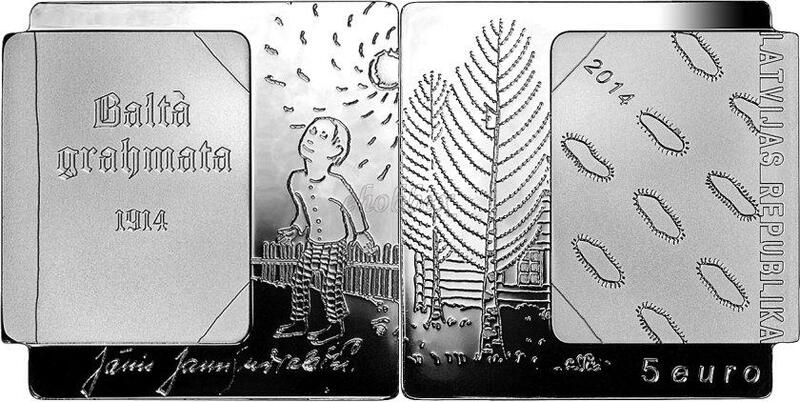 The coin's obverse features an image of the cover of Jaunsudrabiņš' White Book adorned with floating clouds. The inscription LATVIJAS REPUBLIKA is running down from the top along its right side, and the year 2014 is placed slantwise on the left. The square background features contours of a birch-tree-enclosed homestead, an illustration from the book. The inscription "5 euro" is placed at the bottom right. The reverse features an image of the book's cover with the title Baltā grāmata (The White Book) in Gothic lettering and the year 1914. The square background bears an image of a small boy and the Sun shining on him, an illustration from the book. Facsimile signature of Jānis Jaunsudrabiņš is placed at the bottom. This coin is available in our shop. Click add to cart button or product name link for details.